Living an environmentally friendly life can seem like a daunting task, especially when faced with the potentially extreme option to live a no-waste life—where your entire trash output for a year can fit into a single mason jar. But those changes aren’t always easy and can require extreme diligence and planning. Instead, there are numerous easy ways to go green that you can adopt in your day-to-day life. Here are 10 easy ways to befriend the environment, without making the act of going green a full time job. Especially paper and paper products. 30% of landfill waste per year is paper. By reducing the amount of paper used and by recycling it, landfills will have more room and can stay open longer. Not only is producing recycled paper cheaper and more efficient than creating “virgin” paper, but recycling also helps to preserve trees and forests. Remember, this includes not only loose leaf paper, but also paper cups, napkins, receipts, newspaper, magazines and junk mail, paper bags, and bills. Preferably, switch to reusable or paperless options that are still environmentally friendly. If everyone created a compost pile or bin in their backyard, another 27% of landfill waste could be eliminated. Food scraps (especially from vegetables and fruits) and yard trimmings can be used to create a rich soil that will not only provide a healthy environment for plants, but will help reduce the use of chemicals to treat ailing plants. 3. 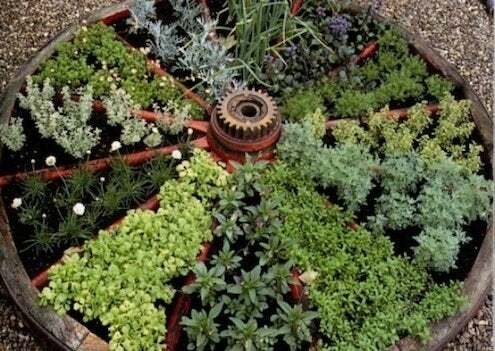 Grow an herb and or vegetable garden. Growing your own plants can help reduce the use of pesticides and herbicides and it will reduce the need for fuel spent going to buy the food. Not only are you providing yourself with food, but any scraps from maintenance or after eating can go into your compost pile. Herbs are also great for drying, reducing not only your cost, but also the cost of the packaging they come in. This is an especially important eco-friendly move since many states are currently experiencing severe drought. When watering plants, do so early in the morning so the water doesn’t evaporate. Drip systems are best so that water from sprinklers and hoses aren’t watering cement or staying on leaves for the sun to evaporate later. When brushing teeth, don’t run the water. Shutting the water off while brushing your teeth can save 5 gallons daily! Take showers, not baths, and use pressure reducing showerheads to conserve more water. Baths can require almost twice as much water; shaving two minutes off of a shower can save ten gallons of water a day. Additionally, it takes more energy to heat water for a bath. Showering will help to reduce energy costs. Invest in reusable canvas bags to use while shopping. Not only are they sturdier (prevents using multiple bags due to ripping, especially for produce and other heavy or awkwardly-shaped items) but they are generally bigger too. Their spaciousness and sturdiness make them handy for occasions other than shopping—day trips, moving, bbqs and picnics, supplies for art students—the possibilities are endless. At the very least, if you use plastic bags, reuse or recycle them to be more eco-friendly. This small step makes a big difference. 6. Be smart about water consumption, and get a reusable water bottle. Last year alone, Americans used as many as 50 billion plastic water bottles, can you believe it?! And that’s just one wealthy country, producing tons of unnecessary waste each year. According to Ban the Bottle, only 23% of those purchased and used plastic water bottles are actually recycled, leaving more than 38 million plastic water bottles in landfill, in a single year alone. So what are the options, when it comes to being smarter about water consumption? Well, there are several. Several cities and towns across the country feature amazing tap water, which should be considered the gold standard of drinking water. Cities like Portland have some of the best water anywhere in the country, and the need for purchasing plastic bottles is virtually nil. But if you live somewhere that you think has tap water that’s less than drink-able, there are other options for you to consider. For instance, anyone can buy a filtration system on amazon, for example, which then allows them to make Alkaline Ionized Water for drinking, just by attaching a small counter-top unit to the tap or to the pipe below the sink. With just a small amount of effort, each of us can basically eliminate the need for purchasing plastic water bottles, saving money and the environment in the process. As part of the process, it’s easy to buy a BPA free water bottle and to start using it every day! As noted above, the vast majority of plastic water bottles are not recycled, and they take thousands of years to decompose. Also, tap water is more strictly monitored than bottled water, so it tends to be a healthier option. 7. Buy in bulk…especially for food. While these foods can seem a bit more expensive, bulk buying is actually saving you money and waste. Buy from bulk bins, especially for grains, nuts, spices, and for the individuals with a sugar tooth, candy. The money you pay is for the food itself, not the waste package it comes in. Reduce plastic waste as much as possible. 8. Replace light bulbs with CLFs. Compact Fluorescent Light Bulbs use up to 75% less energy and last up to 10 times longer than incandescent bulbs. CFLs are much more efficient as they convert most of the energy to light, not heat. This is a tougher, but still realistic way to go green. Not only do you get a great workout, but you are reducing car emissions and pollution. For local errands, biking is a great alternative, benefiting not only the environment, but you as well. For longer commutes where biking isn’t a viable option, opt for taking the bus or carpooling. …in as many aspects of your life as possible. Only wash clothes and dishes when there is enough for full loads. Use old clothes as rags or towels in place of paper towels, even for food and napkins. Use a rain barrel to catch water to use on plants. Utilize mother nature. Hang dry clothes and open windows for light and air. The possibilities are endless. Living an eco-friendly life is easy once you decide to make a few simple changes. The simple ways to live green are numerous and for the more serious types, there are many more ways to create a much more earth friendly living. This entry was posted in Green Living Issues and tagged 10 Ways You Can Live a More Eco-Friendly Life, how to reduce water use, Live a More Eco-Friendly Life, tips on recycling and composting. Bookmark the permalink.